When these two men meet over a dish of five-cheese broccoli-noodle casserole, sparks fly. Who knew a welcome-to-the-neighborhood gift could give both of them their chance at love? Having only read one of O’Riley’s short stories prior to this, I count Whiskers of a Chance to be the first full-length novel of the author’s I’ve consumed (as read isn’t the correct term). That’s because my previous experience was a mere taste of the author’s writing, whereas this gave me the opportunity to fall into the world she created – and what a world it was. I must confess that I listened to Whiskers of a Chance completely out of order of my review schedule because the audiobook sample was a steamy scene that was made even sexier by Beck’s beautiful accent. It’s true that Beck’s narration was a big reason as to why I chose the audiobook, but O’Riley’s storytelling made this an extremely enjoyable tale that I cannot wait to listen to again. I do believe this is the first book I’ve ever read featuring a lynx shifter, so it was nice how information about the animal was peppered throughout as Keith taught Jason about his cat, his tribe, and what the future would mean for them if Jason accepted Keith as his mate. But I’m getting ahead of myself a bit here, kind of. The book opens with Keith telling his father that he and his sister, Taylor, have purchased a house, closer to their jobs, and will be leaving tribe land. To say that daddy dearest was an unhappy alpha would be an understatement. Then again, scowling, grumpy, and controlling seems to be their father’s default setting, and it makes it easy for the reader to understand why the Skyler siblings are ready to be off pack land. What makes the move even more interesting is that Keith scented his mate in their new neighborhood, which both excites him because he never thought he’d find his mate, and terrifies him because he was raised being told that matings are always between a male and a female, so as a homosexual, he has no interest in finding his mate as he cannot envision fulfilling his duty as an alpha to produce an heir. Quite the quandary for Keith. Fortunately for him, Baast has bigger things planned for him and his mate, and their circle of friends, which grows significantly throughout the book. I would apologize for my vagueness, except that there is so much that occurs in the novel that I don’t want to reveal because I don’t want to ruin the experience for others. O’Riley has created a fascinating world with the lynx shifters and the manner in which she weaves other supernatural beings into Keith and Jason’s world made Whiskers of a Chance an extremely enjoyable book. Although there isn’t a big rehash of Jason’s past, it’s clear from his insecurities and behaviors that he’s had more than one bad boyfriend experience. Watching Keith balance the courtship of his mate with hiding his mate’s existence from his father, all while trying to create a “safe” home for his sister and nephew was very entertaining – and that’s without even considering the steamy scenes. Yowser! But the combination of O’Riley’s story and Beck’s narrative talents made Whiskers of a Chance a truly lovely audiobook that I look forward to listening to again and again. I really enjoy O'Riley stories. This was no different. There was a lot going on in this story. From the budding relationship, to the development of a tribe that won't allow intolerance. I love how Jason and Keith have to communicate constantly. I think they have a great relationship because Keith has to talk Jason into being with him – to convince him that the "mate" issue still allows for choice. There are insecurities, mainly on Jason's part, which I found to be quite redundant. Then you have Sasha – who I LOVED. I really hope he gets his own story. His fierce dedication to Jason and anyone associated with Jason is admirable. I love how he was able to shed light on the mate situation, give Jason a reality check on whether or not Jason truly loved Keith, and how Sasha was able to divulge the true nature of vampires. Then you have Keith's family – both blood and chosen. The secondary characters in this story were great. They added depth to both Keith and the story. I do wish that O'Riley hadn't shown several scenes twice, but from slightly different viewpoints. It seemed to drag on because we had just read the scene and here we were reading it again. However, I didn't necessarily think that it detracted, just made the story feel like there was filler. Tempe is a hopeless romantic who loves strong relationships and happily ever afters. Though new to writing M/M, they have done many things in their life, yet writing has always drawn them back—no matter what else life has thrown their way. They count their friends, family, and Muse as their greatest blessings in life. They live in Wisconsin with their children, reading, writing, and enjoying life. Tempe is also a proud PAN member of Romance Writers of America®, WisRWA, and Rainbow Romance Writers. Tempe’s preferred pronouns are they/them/their/theirs/themselves. 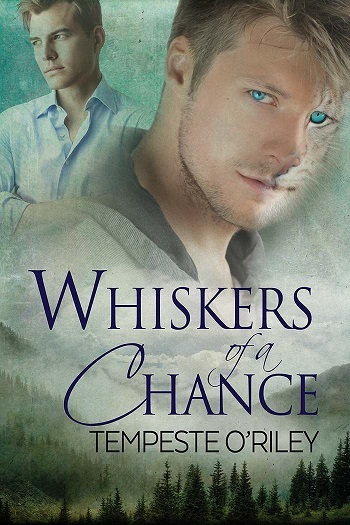 Reviewers on the Wicked Reads Review Team were provided a free copy of Whiskers of a Chance by Tempeste O'Riley and Narrated by Craig Beck to read or listen to and review.